Silver Trading Calls: Taper goes in Vapor. Is Fed's credibility at stake? Taper goes in Vapor. Is Fed's credibility at stake? "Fed delays Taper, monthly bond buying is intact at USD 85bn per month." 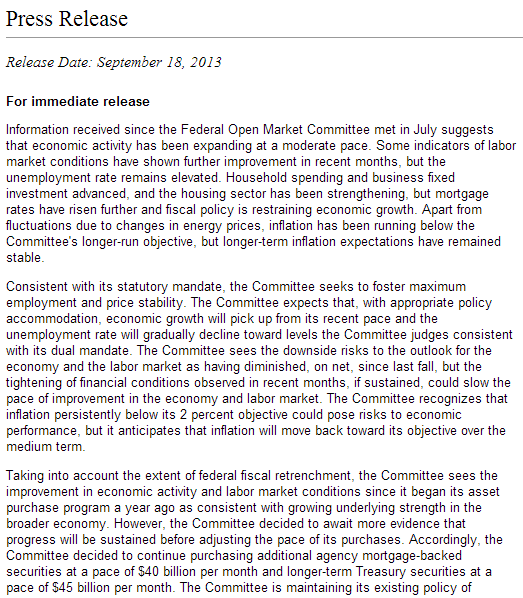 Federal Open Market Committee's much awaited bond Tapering program failed even before its start. For the past couple of weeks rumors about Fed's tapering between $5bn to $15bn were all over the market and market had well en-cashed those rumors. Finally the day came and to everyone's surprise it delayed monthly bond tapering program. Before the meeting someone said that Bernanke might simultaneously announce that he's winding down QE and winding down his career as Fed Chairman. In fact he has done neither. In post meeting press conference Mr. Bernanke answered that unemployment was lower but not low enough (benchmark of 6.5% has set by Fed. Also he warned of the potential "very serious consequences for financial markets and the economy if the country defaults on debt or if the federal government has to shut down due to a congress failure to reach a budget deal." As we said in our last post No matter what Bernanke says, Markets are going to get crazy, and so it did. Gold prices rallied immediately after the FOMC announced that it would leave its monthly bond purchases unchanged at $85 billion a month, in a decision that surprised the market. December gold futures were up $55.40 an ounce at $1,364.80 on the Comex division of the New York Mercantile Exchange. December silver was up $1.331 at $23.115. Nymex October platinum rose $40.70 to $1,463.10, while December palladium gained $10.70 to $717.65. Five minutes ahead of the Fed announcement, December gold futures were trading at $1,313.50, December silver was at $21.695. October platinum was at $1,433, while December palladium was at $704.65 and December copper was at $3.2835 a pound. Market participants widely expected that the Fed would announced a cut to its bond-buying program, known as quantitative easing, ever since Chairman Ben Bernanke said in May that the Fed was preparing to taper its asset purchases as economic conditions warranted. So when the Fed said it put off tapering until later in the year, it came as a surprise. Hence Gold prices rallied sharply, so did the stock markets. The S&P 500 jumped to hit a new high of 1729.44. The Nasdaq rallied to hit its best level in 13 years. The Dow Jones Industrial Average spiked nearly 150 points, setting a fresh intraday high of 15,709.58. US Dollar Index fell nearly 1.28% to make a new low in past seven months. The Fed said it will keep buying bonds as long as the unemployment rate remains above 6.5% and inflation between one and two years ahead is projected to be no more than a half percentage point above the Fed’s 2% longer-term goal. In August, the Department of Labor said the U.S. unemployment rate is 7.3% and inflation has run well below 2%. Previously, the Fed had signaled a 7% jobless rate for a sign to start the end of stimulus. The Fed may not taper until the unemployment rate is “well below” 6.5%, Bernanke said, and suggested rates may remain low, even if the jobless is rate is down if inflation is also subdued. The Fed cut its U.S. growth forecast for the third time this year, saying the economy will grow between 2% and 2.3% in 2013, down from 2.3% to 2.8%. It predicted an inflation rate no higher than 1.2% in 2013. The bank is unlikely to raise the short-term fed funds interest rates until 2015. Its now Fed's QE vs US Debt ceiling.